More than twenty different models are available, including: heavy-duty friction saw cut-offs, cold saw cut-offs, double shear cut-offs with mechanical clutch or hydraulic actuators, orbital cut-offs, carbide tool rotary cut-offs, laser and plasma cut-offs, bandsaw cut-offs and cut-offs specially designed for inside scarfed tubes and for special profiles. Depending on the need of use, tube sizes, material type (carbon or stainless steel), material steel grade, performances required, our large selection satisfies every necessity. Cut-offs designed with special attention focused on safety aspects, to cut small, medium and large size round tube and profiles using cold saw and friction cutting technology. Movement of the carriage is controlled by belt or rack and pinion accelerator that provides the necessary thrust force to perform the cutting cycle in accordance with the established performance parameters. The machine is optimized in order to make a clean in-line cut without distortion, in accordance with the maximum quality levels permitted by this type of cutting technology. All functions of the unit are managed by a microprocessor, which makes it possible to control the machine with a very high level of reliability, ensuring very precise cutting lengths without influencing the effective production speed on the basis of which the cut-off performance parameters are optimized. The guaranteed bar length tolerance is ±1.5mm at the maximum operating speed, although significantly higher precision is also possible. These cut-offs are fully automatic: once programmed they can operate without requiring the constant presence of the operator at the control desk; these units are pre-tested at the factory prior to shipment. Cut-offs designed with special attention focused on safety aspects, to cut small, medium and large size round tube using laser cutting technology. Movement of the carriage is controlled by a belt-type accelerator that provides the necessary thrust force to perform the cutting cycle in accordance with the established performance parameters. The machines have been optimized in order to make a near-perfect in-line cut that is absolutely clean and free of distortion or burr. All functions of the unit are managed by a microprocessor, which makes it possible to control the machine with a very high level of reliability, ensuring very precise cutting lengths without influencing the effective production speed on the basis of which the cutoff performance parameters are optimized. Cut-offs designed with special attention focused on safety aspects, to cut small, medium and large size round tube and profiles using bandsaw technology. The machine has been optimized in order to make a clean in-line cut without distortion or burr. In the case of model TCSN168, all functions are managed by a microprocessor, which makes it possible to control the machine with a very high level of reliability, ensuring very precise cutting lengths without influencing the effective production speed on the basis of which the cut-off performance parameters are optimized, while in the case of the other two models, TPSN764 and TPSN895, the functions are controlled exclusively by a PLC. These cut-offs are fully automatic: once programmed they can operate without requiring the constant presence of the operator at the control desk; these units are pre-tested. Cut-off was designed with special attention focused on safety aspects, to cut small and medium size round tube and profiles using cold saw technology. The structure of the machine is composed of a fabricated base in normalized steel supporting the carriage, which runs on linear recirculating ball guides or standard wheel (depending on the model). 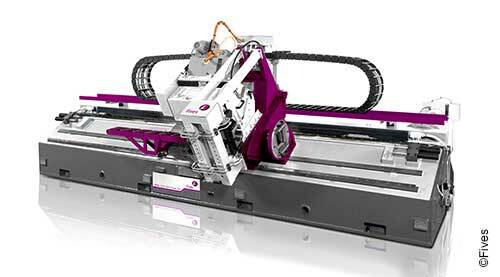 The carriage is equipped with two or four saws that make the cut by rotating about the profile. 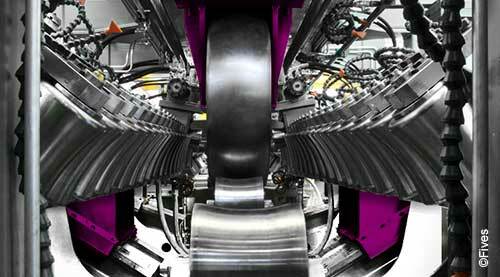 Movement of the carriage is controlled by a rack and pinon accelerator that provides the necessary thrust force to perform the cutting cycle in accordance with the established performance parameters. The machine has been optimized in order to make a near-perfect in-line cut that is absolutely clean and free of distortion or burr. Cut-offs were designed with special attention focused on safety aspects, to cut small and medium size open profiles by means of cutting technology based on a shear activated by a "hydraulic shearing press”. This unit is designed to be interchangeable with an optional cut-off featuring friction saw and cold saw cutting technology. The structure of the machine is composed of a fabricated base in normalized steel supporting the carriage, which runs on linear recirculating ball guides. The machine is optimized in order to make a clean in-line cut without distortion or burr, in accordance with the maximum quality levels permitted by this type of cutting technology. Cut-offs designed with special attention focused on safety aspects, to cut round and profiled tubes by means of cutting technology based on a shear activated by an "oscillating press". The structure is composed of a fabricated "casing" in normalized steel to support a press that exploits the rotary motion of a central crankshaft connected to a flywheel to generate the energy needed to cut the tube. The carriage, made of high strength lightweight aluminium alloy, runs on case hardened and tempered steel rails driven by the rod of an external belt-driven "accelerator", designed to provide the necessary thrust force to perform the cutting cycle in accordance with the established performance parameters. The machine has been optimized in order to make a clean in-line cut without distortion or burr, in accordance with the maximum quality levels permitted by this type of cutting technology.